I LOVE how this quilt turned out. This is the Quick Curve Ruler and it’s fabulous. I only made 9 blocks…so it’s a nice kid size. Not sure how I’ll quilt this yet…so it will be added to the ever growing pile of quilt tops I don’t plan on finishing any time soon. Yesterday I made the best snickerdoodle cookies, but apparently cumin looks a lot like cinnamon…and I rolled 2 dozen cookies in cumin. I didn’t even realize until they were baking and my house started to smell like burning tacos! I’m saving them until I can think of a “special” someone to give them to. ;) Yum! The cumin snickerdoodles are hilarious! This quilt is so amazing! Added this to my list of quilts to make :) Enjoy those cookies too! OMG! You made me giggle with those cookies. :P Gorgeous quilt top! I really need to get brave and try out my ruler! That quilt top is beautiful! I hope you get inspired on the quilting and finish it sooner than expected. 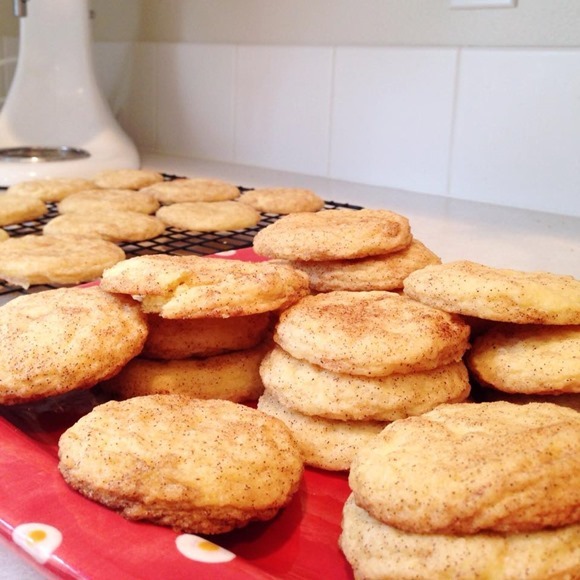 Cumin snickerdoodles, yum! I was covered a pan of s'mores bars with pepper. We didn't eat those either. I secured savoury chicken breasts stuffed with ricotta cheese and spinach with mint-flavoured toothpicks. For a dinner party. Oh my gosh. That is something I would do! 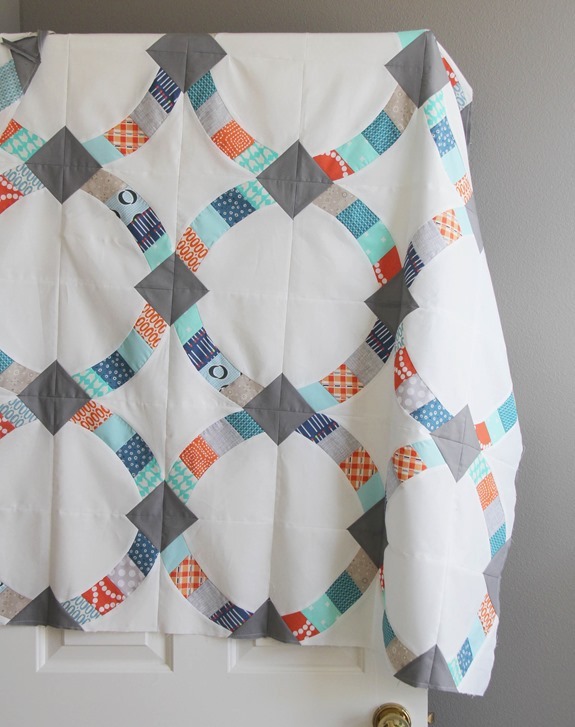 Oh…and the quilt top is cute too, but that white space would be intimidating to me to quilt! Do you have plans for the quilting yet? Wow, your quilt top looks great! Love the quilt. I once sprinkled seasoning salt all over the top of a zucchini bread thinking it was cinnamon and sugar. I love the modern colors in your quilt top! Too funny about the cumin! Best culinary breakthrough in our kitchen: dredging soft shell crabs in confectioners sugar instead of flour. Voila! Candid crabs! FYI, we no longer use plain glass canisters. Once, when my parents were out of town, I decided to make blueberry pancakes for my younger siblings. So, I went to the freezer, grabbed a bag of frozen blueberries, and tossed them in the batter. Well, it turns out that they weren't blueberries. They were black beans. I wouldn't recommend black bean pancakes. How about fettuccine with sweetened condensed milk instead of evaporated milk? That was an interesting meal! Your cookies would pair up nice with my pasta. Beautiful!!! Curves intimidate me, but that top is gorgeous!! Hey – you can't tease us about those cookies without sharing the recipe! Beautiful quilt! It would drive me crazy to have a bunch of finished tops sitting around! When the top is finished, I can't wait to get it to the long-arm quilter so I can get the quilt back, put the binding on – which is one of my favorite parts of the whole process – and have the finished quilt in house 😊. But as they say: each to her own! LOL! Pretty quilt,pretty cookies. Glad I am not the only one who has done something like this. OMG – that is funny – the cookie mistake! Well, we all have kitchen stories and at least your lovely quilt came out! Very pretty! The quilt is awesome and the recipe mishaps made for excellent reading with my coffee this morning. So good to start the day laughing! Long time ago when I was about 12 I was helping Mom out starting burgers for supper…all spices came in a can back then and I used Cinn instead of pepper…made them spicey hot and yeah didn't eat them either… hmmmm…now that I think about it no wonder I was sent out to help with the milking chores instead of allowed in the kitchen….Bahahha! 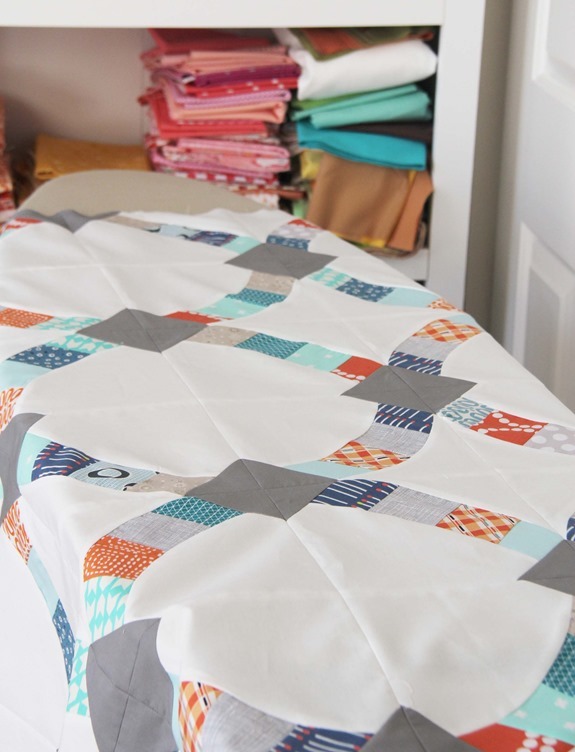 LOVE your Metro Hoops quilt – and the colors….mmmmm! I'm working on the Metro Rings – well, I've opened the jelly roll – it's a start! Your cookie story it hysterical! hahaha! This quilt is so beautiful – I'd never heard of Sew Kind of wonderful before or the quick curve ruler – just love their patterns. Was it slow to sew the curves ? 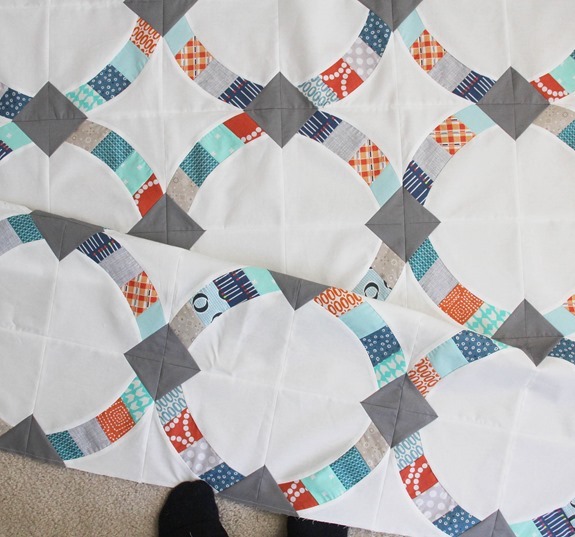 Metro Hoops is on my very very long bucket list – congrats on yours it's beautiful and you'll have so many quilting options. Your top is beautiful! I have a stack of tops too, bet mine is higher than yours. I like your attitude about them! I hate baking accidents! My usual one is mistaking salt for sugar. Those can't be passed off to the adventurous eater unfortunately! And, you know, if you're camping and it's dark… powdered milk and powdered lemonade mix look a lot alike. Only powdered lemonade isn't very good in your mac and cheese. I feel that pattern and ruler may end up on my Christmas List. Great looking quilt top. I haven made snicker doodles for ages, these look delicious, shame about the cumin …. Great new cookie recipe! Not even April 1! And the quilt top is beautiful! Looks quite complex! Wonderful Quilt! I like Snickerdoodles, but I'd prefer Corriander instead of Cumin. Enjoy them. that is so funny about the snickerdoodles. I have mixed spices before and the dinner didn't turn out so good. LOL Your quilt top is wonderful. I love the colors on white. What a great cookie story…maybe call them tacodoodles….sort of like my new puppy who's a labradoodle! I laughed out loud at your cookies story! maybe freeze them and bring them out again for April fools day? the quilt looks gorgeous! I love it. I spiced my taco meat with nutmeg thinking it was cumin. I've made the exact same spice mistake, but with pumpkin pie. For Thanksgiving dinner. Glad I'm in good company! OMG Allison, you made me laugh out loud, in my kitchen, alone, in the middle of the night. Maybe because it made me think of something that would happen to me. Don't you absolutely love the Quick Curve Ruler. I know I do. Love hearing what's going on in your world. Quilt is just lovely! I don't cook or bake, if I can at all help it, so I can't even begin to imagine what difference cumin vs. cinnamon makes. Do they taste bad or just different? Variety is the spice of life, maybe cumin is the same? Had to laugh at the cumin Snickerdoodles. I got to experience cumin pancakes when my 80 year old Dad made us pancakes for breakfast and thought he put cinnamon in them. We didn’t have the heart to complain, but he took one bite and said “what’s wrong with these? They taste terrible.” I will have to tell him it happens to other people too, that will make him feel better! Thanks for the laugh and the memories.